Living room of the apartment Adlerhorst. Like the eagle (“Adler"), one of the most impressive animals of the Alps, which builds the biggest nests, stands the “Adlerhorst” apartment. 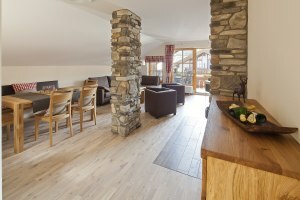 It is built for space and tranquility with an airy and open alpine design. 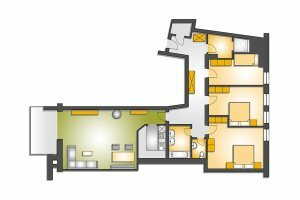 This 4 room apartment offers 109 m² (1,173 ft²) of space for 4 to 8 people and consists of 2 spacious sleeping rooms with a balcony, one small room with a sleeper sofa (this room serves well as a nursery) and a living room equipped with a high qualitity sleeper sofa. The highlight of a cold winter evening would not be complete without the fireplace, which gives the open living area a light and enchanting ambiance. 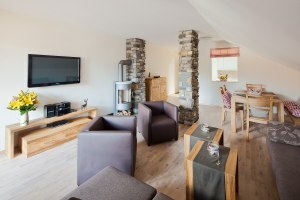 If wintertime is not your cup of tea, this apartment boasts a majestic panoramic view of the Rubihorn and Grünten Mountains to enhance summer romance. Of course, the living area comes complete with a flat screen TV, Hi-fi system DVD-Player and separate dinette. The fashionable build-in kitchen is equipped with an oven, four-burner stovetop and dish-washer for your convenience. The two separate bedrooms, each with a double bed, have access to a balcony offering privacy, peacefulness and space. The master bedroom comes with a flat-screen TV. In the two bathrooms, you will find a floor-level shower and a bathtub, a toilet, a sink with towel racks, a mirror and a cosmetic mirror as well as a hair dryer. Additionally, you will find a separate toilet in the apartment. As a guest of our apartments "Gamsnest", "Adlerhorst" and "Murmelbau" in the center of Oberstdorf, you will receive free daily tickets for the mountain gondolas in Oberstdorf and the nearby Kleinwalsertal (Nebelhorn, Fellhorn, Kanzelwand, Söllereck, Walmendinger Horn and Ifen) in the summer months between May and October. That is a saving of more than 37,00 €. Non-binding inquiry: We are pleased to send you an offer.